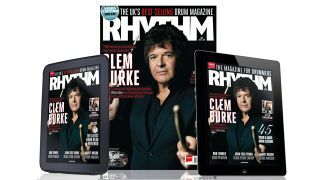 Clem Burke graces our cover this month to talk about how he likes things to be done the traditional way; how Blondie survived the New York punk scene; the most dangerous gig of his life, and how he keeps it fresh after over forty years in the game. Learn how to play: 'Roots Bloody Roots' by Sepultura, Madchester anthem 'She Bangs the Drums' by The Stone Roses and 'Pretzelbodylogic' by Prince and 3rdeyegirl. Plus there's all your favourite regular lessons from Jason Bowld, Erik Stams and Colin Woolway. All this and more in the july issue of Rhythm available from all good newsagents, onlineor digitally at the Google Play Store or from Apple Newsstand. Get yourself a copy from Apple Newsstand and enjoy all of our tuition content plus bonus videos, image galleries and other content.